After more than three decades – thirty three years to be more precise - of leaving their mark in music, iconic heavy metal band Mötley Crüe has decided to call it quits. Described through the years as the world's most notorious rock band, and after laying claim to be one of the world's bestselling groups of all time (they’ve sold more than 100 million albums), members of the band - Vince Neil, Nikki Sixx, Tommy Lee and Mick Mars - announced in a press conference at Beacher's Madhouse at the Roosevelt Hotel in Hollywood, that they would be retiring. Before bowing out the band will be going on mega farewell tour, with a series of 72 concert dates that will take them through the end of 2015, with Alice Cooper to be joining them on tour as a special guest star. The announcement however does not come as a complete surprise, as members of band had already broadly hinted to the media several times last year that they were thinking of retiring. “We always had a vision of going out with a big f------ bang and not playing county fairs and clubs with one or two original band members," drummer Tommy Lee said. "Our job here is done. " 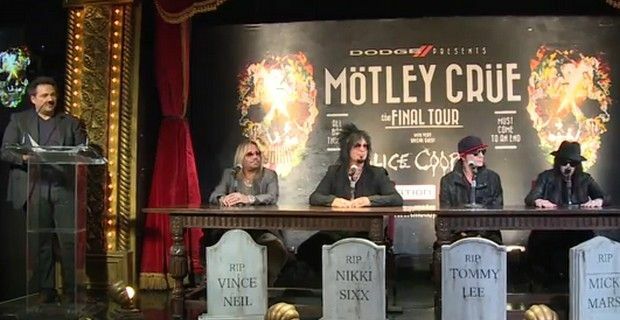 The Mötley Crüe members also signed an official "cessation of touring agreement" confirming that the tour will be their final one and they will not to perform as Motley Crue after 2015. The group said that they want to "go out on top" and added “we want to leave a legacy” and "We want to have some dignity." The band also plans to release a tribute album, and a film adaptation of the their 2002 book, 'The Dirt'.